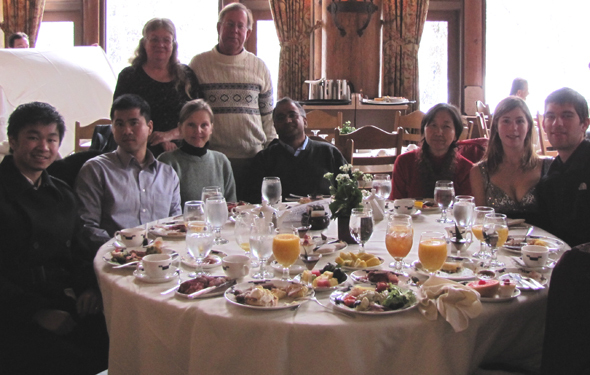 Since 1998 at the end of the annual De Anza Outdoor Club winter Yosemite camping trip (and regularly after summer Tuolumne trips), many, if not most people, and often all trip members, have gone to Sunday brunch at the Ahwahnee hotel (temporarily renamed the Majestic Yosemite Hotel) in a grand dining room with a 34′ high trestle beam ceiling, floor-to-ceiling windows and twinkling chandeliers. 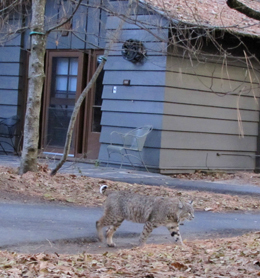 Photo below courtesy of the park concessionaire Delaware North. 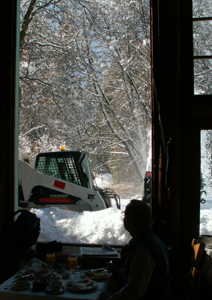 Photo below, taken in the waiting area outside the Ahwahnee dining room, by Michael Gregg. bagels, cream cheese and smoked salmon, green salad, fresh fruit, prawns, scrambled eggs, bacon, trout, poached salmon, eggs Benedict, oysters, chocolate covered strawberries, pancakes/waffles, orange juice, grilled and/or marinated vegies, various sliced fruit, cheese plate, pasta, chicken, potatoes or hash browns, madeleines, creme brulee, tarts, cheesecake, crepes, blintzes … all the desserts are freshly made in-house. It’s a wonderful place to soak in the sunshine coming in the big windows, finally let your toes thaw, and go back for seconds, thirds, fourths (…?). It will set you back (Feb. 2019) cost: $56.00, plus tax $4.39, plus 18% gratuity $10.08, Total: $70.47. 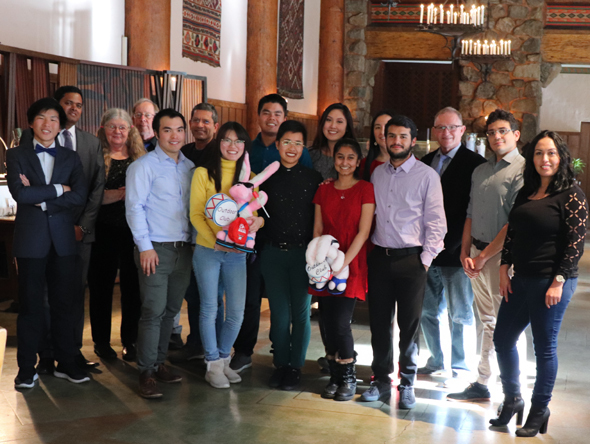 (If you seat in a group of six or more people they add a required 18% tip and we always seat in groups that size or bigger). But people decide it’s worth it after eating instant mashed potato cups and the like in a campground or at a picnic area out in the cold all weekend. See the menu for some individual entrees if you don’t want the whole brunch. 2005 pictures below by Deepak Chandani. Group February 2006 photo by the campground host, Kathy Spalding, who came to brunch with us. 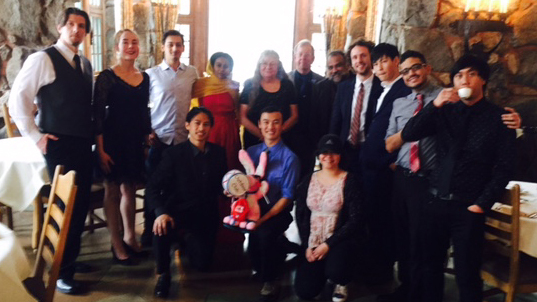 and some of them danced. 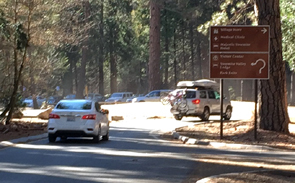 Here are a few hints about the logistics of getting from the campground, Half Dome Village or Yosemite Lodge to brunch in interesting weather . This advice is for people who go to the shower house Sunday morning before brunch, but a lot of it applies any day you go. 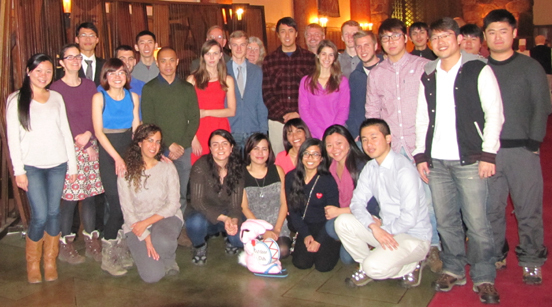 After packing up the campsites the campers go to Half Dome Village (Curry Village) and get showers. People staying at Half Dome Village can decide whether to pack up first and then take showers or vice-versa, depending on how late they need to sleep. Especially in the winter when there are fewer people around, no one should go to the shower house alone. Everyone changes into good clothes they kept clean during the adventure, at least ‘Friday casual.’ They wear their boots to the shower house and leave their good shoes in the car. The shower house has blow dryers mounted on the walls, but you might want your own hair dryer. Bring a couple of big plastic bags to keep shower spray off your clothes and (bring your own) towels. Some years the main shower house has been closed for cleaning 10 – 11 a.m. and 10:30 p.m. to midnight. Most of the showers in small shower houses at Half Dome Village are only open to guests there. 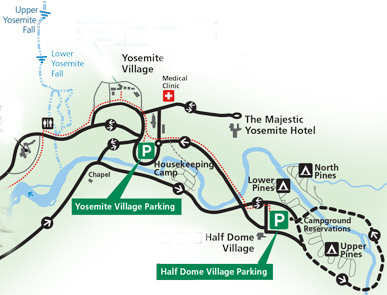 To find the accessible-to-the-public showerhouse (and swimming pool in summer), when you take the bus to Half Dome Village (Curry Village) or if you drive and park in the free shuttle parking / Half Dome Village parking, look for a driveway to the left of the stores. If you are doing your shower before brunch on Sunday, I suggest that when you go to the shower house, you leave your good shoes in the car and wear your snow boots. (Please do not put on perfume/cologne – people sitting near to you at brunch may have allergies.) After the shower/clothes change put the snow pants back on over your good slacks as you head back to the car. If you are going directly to the Ahwahnee from Half Dome village, note that there is a section of road from Half Dome Village and/or the pines campgrounds on the way to the Ahwahnee (temporarily named the Majestic Yosemite Hotel) that has you drive on the left hand lane and save the right hand lane for buses / ambulances only. drive past the garage and more on your right, back of the store on your left and take a right at the stop sign on to Ahwahnee Drive. 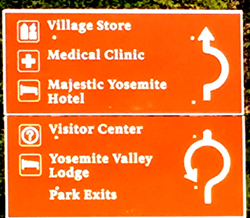 – – – People coming from Yosemite Lodge will drive around the circular round-about and exit on the far side of it from where they came on to it (follow the signs). and drive past the garage and more on your right and make a right at the stop sign. 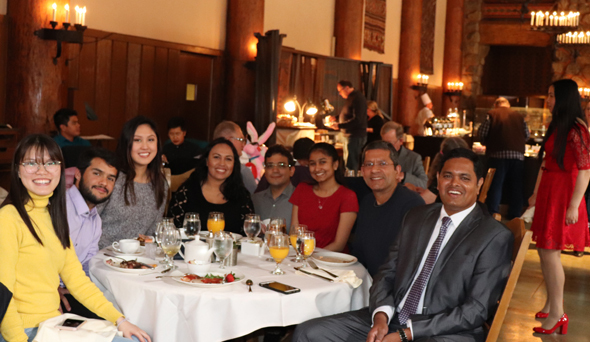 – – – People who came to Yosemite for the day will travel into Yosemite valley on southside drive, and follow instructions to find the Ahwahnee Hotel (temporarily named the Majestic Yosemite Hotel) at the end of the Ahwahnee hotel map page. 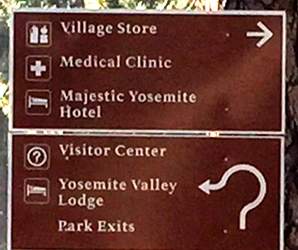 After the right turn on to Ahwahnee Drive, everyone will drive past the Medical Clinic on your left/ employee housing on the right, then past the Ahwahnee meadow on your right / small picnic area on your left. 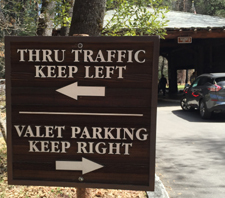 When you get to the Ahwahnee (temporarily named the Majestic Yosemite Hotel) the road you are on will approach a parking lot and have a deliveries road to the right, don’t take it. Stay on the the perimeter road that runs between the cliff face on your left and the parking lot on your right. This road then bears right across the end of the main parking lot and bears left as you pull up under the porte-cochere (roofed two-lane driveway by the hotel main entrance) and drop off passengers out of the weather. Under the porte-cochere there are two lanes. The right lane is for drop off/pickups and valet parking, the left lane is for thru traffic. And yes, more than one person got his large RV stuck when he ignored the “maximum clearance 11 foot 6 inches” sign. If it is precipitating and you drop off passengers under the porte-cochere, people can change into good shoes and leave their winter boots, winter pants that were over their nice clothes, in the vehicle. 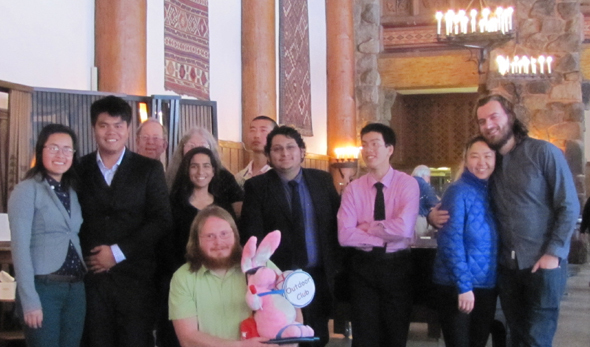 Carry at least the warm/rain jacket with you if you want to do a club tour of the hotel after brunch. (We suggest you hold on to the warm/rain jacket instead of checking it at the dining room entrance, and just put it on your chair.) The driver can then park the car or if it is precipitating and especially if you have spare money for a tip, have a doorman do it. The doorman will keep your keys and get your vehicle for you after brunch. From the porte-cochere (covered entrance) walk down a long covered outside walkway to the hotel main building entrance. When you enter the hotel bear right down a long hallway to the sitting area by a fireplace near the entrance to the dining room (dining room lobby). We will wait until they tell us our tables are ready, then go in together. 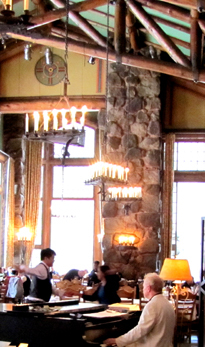 If the (dining room lobby) seating area is full, you could go around the giant fireplace to the other side and look for a comfy seat in the great lounge. 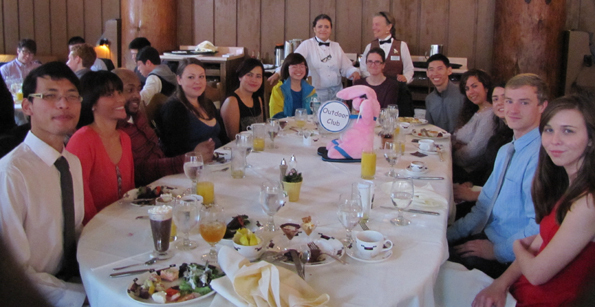 OR we might have planned to meet before brunch for a mini-tour. Restrooms are shown on the map. Men on the ground floor to the right as you go down the long hallway to the dining room, women up the stairs opposite the dining room lobby fireplace. If your showering makes you run late, don’t just walk into the dining room looking for us, as you might be in a second seating. 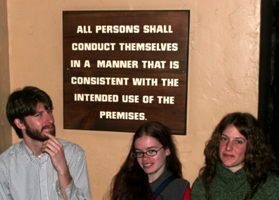 The people at the dining room entrance podium will know what to do. 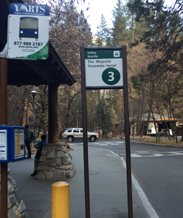 If you ride the Yosemite Valley free shuttle bus to the Ahwahnee, or park in the parking lot, you will need to walk a bit out in the weather. 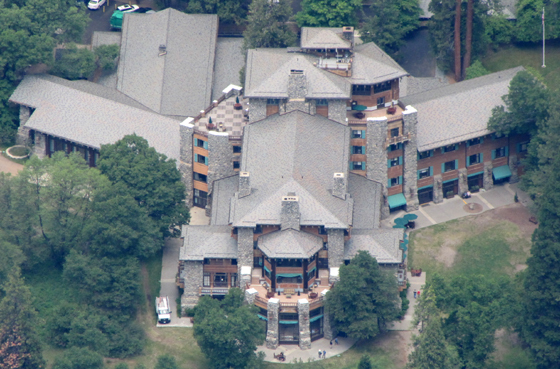 Below, the view from the free shuttle bus stop looking toward the Majestic (Ahwahnee) porte-cochere, notice the end of the white bus under the covered entrance towards the right hand side of the photo. Find the locations of the parking lots, porte-cochere/entrance, dining room, restrooms and more at this Ahwahnee (temporarily named the Majestic Yosemite Hotel) map. Road trip advice and etiquette has practical advice from experienced and newbie carpoolers on cross country trips, including ways to keep from being so bored; planning before the trip; safety issues; drowsy driving; packing; road trip games, storytelling, debates and discussions suggestions; links to gas price watch sites, and how to deal with windows that are fogging up faster than your navigator can wipe it off.